Jackson and co-workers (2018, see reference below) first did a classical offline preconcentration of small seawater aliquots using a SeaFast system. More innovative is the use of a state of the art inductively coupled plasma - tandem mass spectrometry (ICPMS/MS) to analyse the eluate. Such tool combines two mass-selecting quadrupoles separated by an octopole collision/reaction cell. The collision/reaction cell was pressurized with O2 gas for the analysis of manganese (Mn), nickel (Ni), copper (Cu), cadmium (Cd) and lead (Pb) and H2 gas for the analysis of iron (Fe) and zinc (Zn), which removed common interferences (e.g. ArO+ on 56Fe and MoO+ on Cd)... and the detection limits were less than 0.050 nmol/l, which is extremely low! Figure: A schematic diagram of the preconcentration and analysis of Mn, Fe, Ni, Cu, Zn, Cd and Pb in seawater samples. 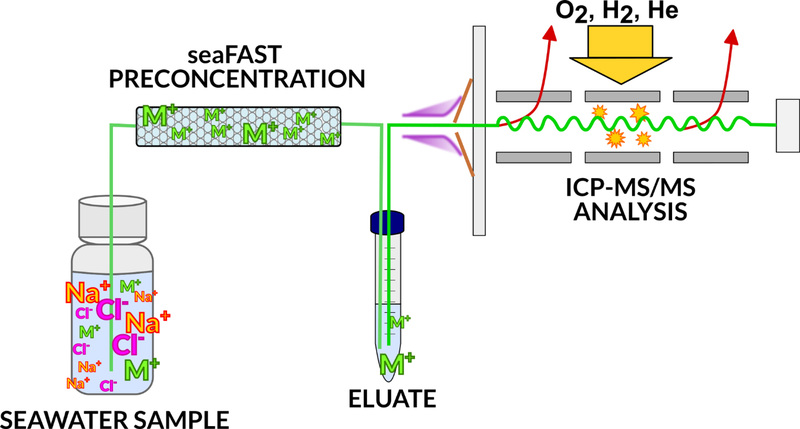 Seawater samples are preconcentrated using the seaFAST preconcentration system, and analysed on an ICP-MS/MS pressurized with either O2 gas (Mn, Ni, Cu, Cd and Pb) or H2 gas (Fe, Zn). Click here to view the figure larger.